Dreamt last night I was being required to justify my entire medical history and current healthcare situation to Kentucky GOP senatorial candidate and Civil Rights opponnent Rand Paul. We were outside at some sort of Ren Faire or low tech theme park, and he was being large and in charge. Despite what the Nevada GOP says, I don't think there's enough chickens in the world to pay for my healthcare needs what with metastatic colon cancer and all. I'd much rather have my healthcare delivery framework legislated by people in the reality-based community than by people who believe their ideology over any evidence whatsoever, let alone the healing power of such personal chimeras as chickens, prayer or market self-regulation. Political nightmares about my cancer. I really have sunk low. Slept well at least, dreams notwithstanding. Lorazepam really is my friend. Hates it, I does. I'm planning to spend a quiet weekend at home (do I have any other kind), though mikigarrison will be visiting. The usual circus next week, with chemo infusion eleven of twelve overlapping the date of my 46th birthday. It bothers me that I don't really leave the house anymore. I've stepped outside my door twice in the last week, once for a brief walk on Sunday with shelly_rae after we de-needled me, and yesterday when my sister drove me to my therapist's office. I probably won't step outside again until next Wednesday's therapy appointment, though the subsequent medical and natal festivities will get me into the open air a few more times before next week is out. Narrow. I am become so narrow. If I had Photoshop I'd make an image of myself as a stickman, because that's how feel. Narrow and tired. 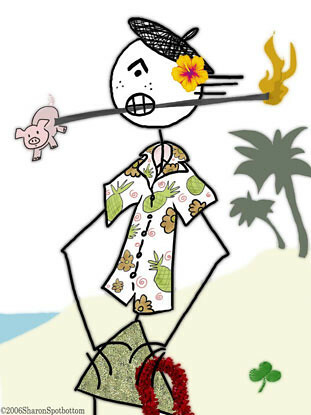 There are shockingly few useful hits when one googles "stick figure wearing hawaiian shirt." I think sometimes about how much the world has changed with the advent of the Internet. I know it's not the same, but at least you can still connect with people through the ether, even if you're temporarily house-bound. I'm so sorry for all you're going through. I had a dream last night that they were reconfiguring the cubicles at work yet again to a longer, narrower format, depite the fact we're moving down a floor in the Fall and going to get BIG desks again. (although they're taking our windows). The weird part was when the guy next to me declared he was so jealous of me getting picked to mentor the new hire class (true) because it meant I got a trip to Mexico to do it. (WTF?) I suddenly paniced about what I would tell my wife.